Vector Linux 7.1 Standard DVD (32-Bit) | Linux DVD Shop - UK Linux Shop supplying Linux on CD, DVD and USB with Free UK Delivery, 24Hr Dispatch. 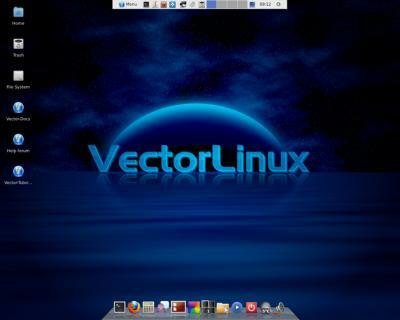 Vector Linux 7.1 Standard is based on the latest Slackware release with the main desktop being Xfce. Vector Linux requires Pentium 3 or equivalent or higher. Vector Linux provides a very fine-tuned distro with Slackware's rock-solid base and the most up to date stable packages available. Some of the bundled applications are: Xfce 4.11.3 as window manager. For a complete web experience you will find Firefox 31.7 with pre-configured Mplayer, Flash, and Java plugins. There is also Scribus, gFtp, Kasablanca, and Sylpheed. Abiword, Gnumeric, Gimp, Povray and Inkscape for graphics and design tasks; for web development there is XAMPP, Bluefish , Quanta, CSSEditor and a full set of java related applications. Other highlights of this release include support for digital cameras, scanners and printers, as well as fax capabities. The K3b CD/DVD burner, ripperx, Kaffeine, xmms, mplayer, amarok and Xine.